04.08.17 10:44;Account;Receive;Received Payment 7.8 USD from account U13315446 to account U1294000. Batch: 184092941. Memo: API Payment. ATOMIC HORIZONS LTD.
05.08.17 09:42;Account;Receive;Received Payment 7.8 USD from account U13315446 to account U1294000. Batch: 184179106. Memo: API Payment. ATOMIC HORIZONS LTD.
05.08.17 07:11;Account;Receive;Received Payment 0.83 USD from account U13315446 to account U1294000. Batch: 184169534. Memo: API Payment. Auto. 07.08.17 11:46;Account;Receive;Received Payment 7.8 USD from account U13315446 to account U1294000. Batch: 184342463. Memo: API Payment. ATOMIC HORIZONS LTD.
06.08.17 21:57;Account;Receive;Received Payment 7.8 USD from account U13315446 to account U1294000. Batch: 184300273. Memo: API Payment. ATOMIC HORIZONS LTD.
08.08.17 11:28;Account;Receive;Received Payment 7.8 USD from account U13315446 to account U1294000. Batch: 184439320. Memo: API Payment. ATOMIC HORIZONS LTD.
09.08.17 09:46;Account;Receive;Received Payment 7.8 USD from account U13315446 to account U1294000. Batch: 184525400. Memo: API Payment. ATOMIC HORIZONS LTD.
10.08.17 10:20;Account;Receive;Received Payment 7.8 USD from account U13315446 to account U1294000. Batch: 184619348. Memo: API Payment. ATOMIC HORIZONS LTD.
12.08.17 10:51;Account;Receive;Received Payment 7.8 USD from account U13315446 to account U1294000. Batch: 184800843. Memo: API Payment. ATOMIC HORIZONS LTD.
11.08.17 11:10;Account;Receive;Received Payment 7.8 USD from account U13315446 to account U1294000. Batch: 184716403. Memo: API Payment. ATOMIC HORIZONS LTD.
13.08.17 12:21;Account;Receive;Received Payment 7.8 USD from account U13315446 to account U1294000. Batch: 184882682. Memo: API Payment. ATOMIC HORIZONS LTD.
14.08.17 09:03;Account;Receive;Received Payment 7.8 USD from account U13315446 to account U1294000. Batch: 184951679. Memo: API Payment. ATOMIC HORIZONS LTD.
15.08.17 11:21;Account;Receive;Received Payment 7.8 USD from account U13315446 to account U1294000. Batch: 185061940. Memo: API Payment. ATOMIC HORIZONS LTD.
17.08.17 11:27;Account;Receive;Received Payment 15.6 USD from account U13315446 to account U1294000. Batch: 185262371. Memo: API Payment. ATOMIC HORIZONS LTD.
18.08.17 11:06;Account;Receive;Received Payment 7.8 USD from account U13315446 to account U1294000. Batch: 185358015. Memo: API Payment. ATOMIC HORIZONS LTD.
22.08.17 09:52;Account;Receive;Received Payment 7.8 USD from account U13315446 to account U1294000. Batch: 185712512. Memo: API Payment. 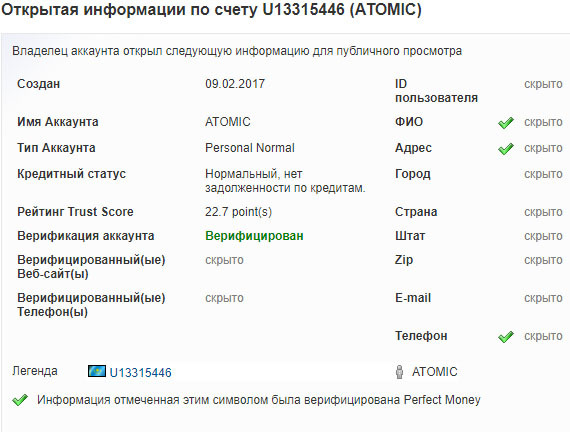 ATOMIC HORIZONS LTD.
23.08.17 11:32;Account;Receive;Received Payment 7.8 USD from account U13315446 to account U1294000. Batch: 185823188. Memo: API Payment. ATOMIC HORIZONS LTD.
24.08.17 10:51;Account;Receive;Received Payment 7.8 USD from account U13315446 to account U1294000. Batch: 185912886. Memo: API Payment. ATOMIC HORIZONS LTD.
25.08.17 09:41;Account;Receive;Received Payment 7.8 USD from account U13315446 to account U1294000. Batch: 185998993. Memo: API Payment. ATOMIC HORIZONS LTD.